Marketable yield is more important than total yield. Physiological disorders like ‘blotchy ripening’ often have negligible effects on total yield but can reduce marketable yield substantially, to the grower’s peril. When it comes to blotchy ripening in tomato, be familiar with how to recognize it, factors that contribute to its development and steps that can be taken to limit its occurrence.Blotchy ripening is characterized by one or more conditions specific to the external and/or internal color of individual tomato fruit. Idealized versions of individual mature tomato fruit are uniformly red over their entire surface and nearly so throughout their interior flesh. Fruit exhibiting blotchy ripening, however, are not. Instead, defected fruit are mostly red on the outside but marked with areas that remain green, yellow, gray or a much paler red than the remainder of the fruit (e.g., Figure 1). Blemished areas may be restricted primarily to the half of the fruit nearest the stem. Internally, the flesh, especially vasculature, of fruit exhibiting ‘blotchy ripening’ may be brown in color or broken down. Symptoms associated with blotchy ripening are not unique to it. These symptoms can be traced to physiological, disease or insect feeding causes. The symptoms can also vary in intensity and frequency; i.e., with regard to the proportions of individual fruit and entire crops or pickings that are affected and to what extent (e.g., of discoloration). Regardless, it is important to note that fruit are said to exhibit blotchy ripening only when they are also in the mid-late stages of ripening as determined by changes in firmness and other variables and when insect (e.g., whitefly) and disease (e.g., TMV) are ruled out as causal agents. These two criteria separate truly ‘blotchy’ ripened fruit from firm, immature fruit in the early stages of ripening (which can be mottled in color inside and out) and fruit damaged by the action of pathogens and/or insects. Blotchy ripening is a physiological ripening disorder.Blotchy ripening has been discussed as a potentially significant marketable yield issue in research and extension publications for at least 76 years. Seaton and Gray of the Michigan Agricultural Research Station reported on their analysis of the anatomy of blotchy-ripened fruit in 1936. Also, after touring commercial and research farms throughout the U.S., Minges and Sadik of Cornell University published a protocol for evaluating blotchy ripening in 1964. These landmark works provided much needed insight on blotchy ripening but too much about the disorder remains a mystery. Many agree that blotchy ripening occurs more often in greenhouse- and high tunnel-grown crops but open field plantings can also be affected. What’s behind the disorder? Why do certain fruit ripen unevenly? What can tomato growers do to limit the disorder in their crops? Immature tomato fruit are green and photosynthetic. In fact, early in their development, tomato fruit can produce a significant portion of the sugars found in them through photosynthesis. Later however, the set of pigments found in fruit of most hybrids shifts and red becomes the dominant color. This shift is pre-programmed but influenced by conditions surrounding the fruit and within the plant and soil. The first and one of the most reliable steps in minimizing blotchy ripening is selecting varieties known to display it very infrequently – i.e., among few crops year to year and among few fruit within a season. Hybrid tomato varieties are the culmination of huge, coordinated efforts requiring in-depth knowledge of tomato genes. Nearly 100 years ago, these genes were found to include a natural mutation that led individual fruit to ripen uniformly red, today’s most common standard. Decades of development of varieties whose fruit turn red over their entire surface and throughout their flesh at precisely the right time relative to other variables related to market-readiness have followed. However, the natural condition of NON-uniform reddening remains in the tomato genome and it shows itself most readily in certain varieties. 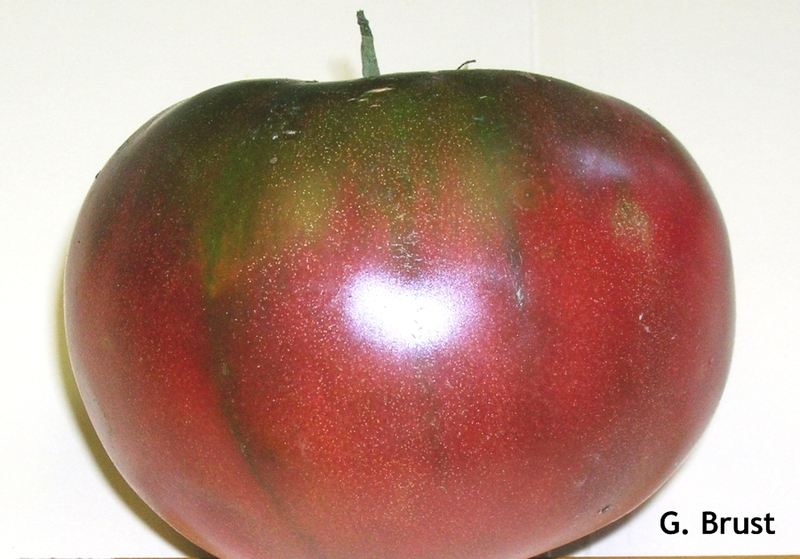 As a category, heirloom varieties may display the blotchy ripening disorder most consistently. Others claim that indeterminate varieties bred for use in climate-controlled greenhouses but chosen by some high tunnel growers can also show the disorder under some conditions; however, to our knowledge, these claims are not supported by independent research. Regardless, as early steps in avoiding blotchy ripening, consult reliable reports on variety performance in your area and select varieties that exhibit the problem rarely, if at all. An example of a variety trial report that includes data on blotchy ripening is available here. A variety’s genes may predispose it to physiological disorders like blotchy ripening but this weakness can be minimized or masked with luck and proper management. The causes of physiological disorders can be difficult or take a long time to determine because blotchy ripening and other disorders are difficult to induce experimentally. That said, many years of research and experience have revealed that blotchy ripening is most prevalent when air temperatures during mid-late stages of fruit ripening are extreme (e.g., below 60 deg F and/or above 90 deg F) or highly variable, when humidity levels remain high, and/or when these conditions prevail and light levels are low. Unfortunately, these are exactly the types of conditions common on some farms in the region recently, especially those containing high tunnels. In general, skies have been intermittently cloudy and sunny, temperatures have risen and fallen sharply over short time periods (often reaching below 60 deg F in unheated areas), and rain has been abundant, leading to prolonged periods of high humidity, especially in minimally ventilated high tunnels. These conditions, in combination with varieties susceptible to blotchy ripening, are causing some marketable yield losses. Nothing can be done to change the weather. Going forward, in addition to careful variety selection, growers are encouraged to minimize temperature extremes and fluctuations as much as possible. As conditions allow, high tunnels should be ventilated so that the interior humidity levels are no higher than ambient, outdoor conditions. Field or high tunnel, though, growers are particularly encouraged to examine their soil fertility and moisture management plans carefully since plant nutrient and water status also influence the occurrence of blotchy ripening. Most in the extension-research community agree that severe cases of blotchy ripening are most often associated with factors that limit the supply of potassium to maturing fruit. These factors include: waterlogged and/or compacted soils, below-optimal potassium application rates, above-optimal nitrogen application rates, excessive application of potassium competitors, excessively large or dense canopies, and the environmental conditions mentioned previously. Potassium supplies may be restricted for different reasons; so, in evaluating and modifying your irrigation and nutrient management plans, do not over-compensate. Three articles written by Gordon Johnson and Jerry Brust of University of Maryland and University of Delaware Cooperative Extension are excellent overviews of the disorder and some peoples’ experiences with it. Also, writing in Practical Hydroponics and Greenhouses, Andrew Lee says that supplying too much water on dark days when transpiration is minimal is “by far the most common error.” Granted, there is a world of difference between greenhouse and high tunnel and field production systems. However, some of the same principles apply in all of them. So, reviewing Dr. Lee’s article is a good idea for many growers.Some speculate that an excessive fruit load may also raise the probability that blotchy ripening will be a problem in some pickings. Data do not yet support research-based recommendations that fruit load be reduced to lessen the occurrence of blotchy ripening. However, growers are encouraged to stay tuned as study results are released and discussed. Yellow shoulder disorder (YSD) is another type of physiological, ripening disorder. YSD symptoms can be similar to that of blotchy ripening. YSD is also strongly associated with tomato variety and soil fertility. Work by Dr. David Francis and coworkers led to a website that prompts growers to enter basic soil test information to help determine if YSD is a low risk in their soil. Two projects supported by the Ohio Vegetable and Small Fruit Research and Development program (OVSFRDP) in 2013 also hope to shed light on the fertility status of Ohio vegetable soils, especially as it affects marketable yield. Working from Piketon, Brad Bergefurd is documenting the effects of specific fertility programs on total and marketable yield, paying special attention to the occurrence of YSD. Evidence from the 2012 run of the experiment pointed to the benefits of monitoring plant nutrient levels, especially nitrogen and potassium, regularly throughout plant development beginning around the time of first flower cluster formation. When they submit crop tissue for analysis, it is true that results may not be returned to growers in time for them to adjust the fertility program significantly. However, Brad emphasizes that the results from routine analysis can be employed to adjust the program year-year, at minimum, if not planting-planting in a year. Working from Wooster, the VPSL is gearing up to compile an overall report on the nutrient status of Ohio vegetable soils. The goal of the report is to help identify steps the industry can take to enhance its success in soil and nutrient management. All vegetable, including tomato, growers are invited to participate by sharing current soil test information for their farms. Stay tuned for more information on participation and its benefits. ← It’s Harvest Time, Do you Know Your Crop’s °Brix Value?